If you wanted to, I could be obliterated, totally destroyed. But this cove is a shelter. I was asked to write about Regina, a band from Helsinki. I'll tell you what makes Regina so significant, possibly the most important group in my life. Over the last few years, no other band has managed to paint a picture of my life in song the way Regina has; the melodies and the lyrics that flow with them. I believe I am not alone. We're dealing with moments of joy. Snapshots no force can destroy. The band, comprised of composer-producer Mikko Pykäri, singer-lyricist Ilsa Pykäri and drummer Mikko Rissanen, is a master of this art. 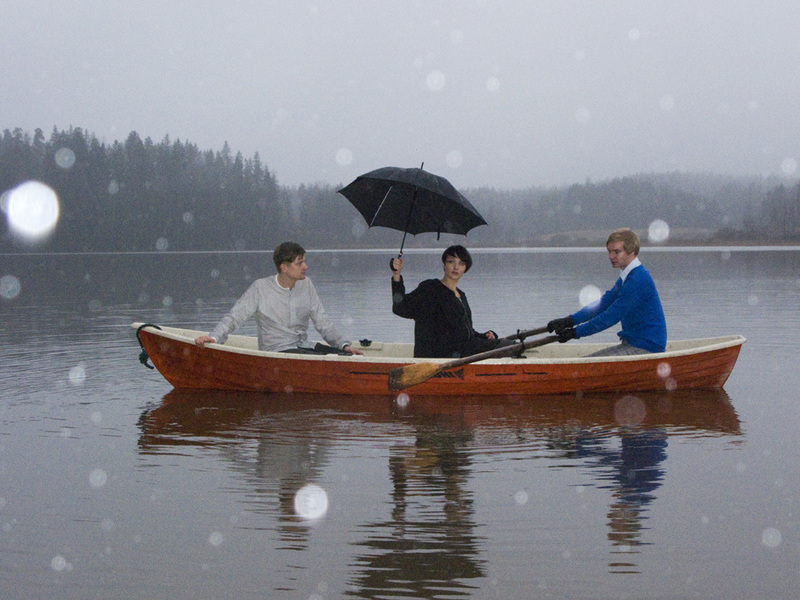 As far as creating songs that start small and evolve into epic emotional journeys, Regina reached an apex of sorts on 2010's Puutarhatrilogia [Garden Trilogy], their first US release. The album's climactic moments, its oh-so-Scandinavian depictions of relationships (the band, after all, sings entirely in Finnish, their native language), ask the question: what is life, in the end, but a series of painfully beautiful moments shared with the people we love? Moments we wish would last forever, but are stored forever in the mind as brief flashes. This fall, the prow of the good ship Regina is pointed at new adventures. Soita Mulle [Call Me] is a courageously plain title, underlining the record's spontaneous ensemble playing. It's Regina's most effortless-sounding record yet, and its sound telegraphs a joyful new direction for the band. Soita Mulle, Regina's first true masterpiece, presents us with a more relaxed, less synth-oriented band. The album's production choices echo the halcyon days of Sarah Records or 4AD, bringing a certain rawness to the band's otherwise elegant sound. The incredible opening song "Unessa" ["Asleep"] with its painfully beautiful opening, would alone justify the album's existence. Over the last few weeks I've listened to this song dozens of times and I've yet to grow tired of it. The same slightly more serious and mature Regina can be heard on the album's closing song, "Valveilla" ["Awake"]. "This is one crop I'm not going to harvest" sings Iisa Pykäri, doing away with her image as a cute and innocent singer. I've never heard Regina in such a fierce mood. "Haluan Sinut" ["I Want You"] is alive with whispers and laughter close in your ear, the late night peregrination from bar to bar on the hot summer tarmac of the city, intoxicating promises for the future. "Lepään Aalloilla" ["I'm Resting On The Waves"] continues band's series of masterful relationship snapshots. "If you wanted to, I could be obliterated, totally destroyed. But this cove is a shelter" is the most beautiful and crushing opening stanza I've heard in quite a while, and the sentiment comes through even for listeners who don't speak Finnish (the majority of the American public, presumably). "I rest on the waves, I know you won't disappear" is one of the most intrinsic things you can say about life. The album's deliciously jangly first single "Jos Et Sä Soita" positively shimmers with the influence of Ride, Cocteau Twins and the guitars from the early days of the Cardigans. "I wrote foreign words on your arm. Look closely and you'll see my number. Ooh ooh ooh," Pykäri sings, playfully seductive, as if teasing a kitten or a boyfriend. "Hours pass, I won't wait for you any longer, maybe it's ok, if you don't call after all. Ooh ooh." This is youth. "Mustavalkeaa" ["Black and White"] is a song you want to hear at full volume at a festival, intoxicated, with your fist up in the air. Yet another perfect pop song à la Regina. There's magic to the way the band manages, time after time, to sound totally current and more importantly, as is the case with all the best pop music, eternal. Its like the effortlessly simple and familiar, yet essential and gorgeous songs have just been waiting to be discovered, somewhere out there. In this case the band discovering the songs displays total mastery, sensitivity and talent, as well as a bold determination to reinvent themselves sonically with each new album. Regina conjures to life melodies that were molded for eternity. Melodies that some of us are one with. ~ Aleksi Kinnunen, journalist.